Houston, C. (2016). Storytime for Learning. Knowledge Quest, 44(3), 6-7. Use the permalink above to read the entire article and learn more about each of the items below. 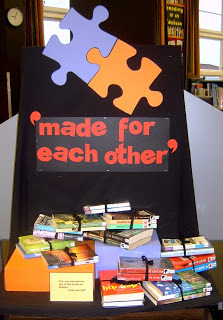 "As school librarians, we know how important literature and the craft of the story are to developing literacy skill in reading, writing, speaking and listening, and language." Abilock, D. (2015). Adding Friction: How to Design Deliberate Thinking into the Research Process. Library Media Connection, 33(6), 30-31. Today many databases also include original content which ranges in length from a paragraph to an essay. Its purpose is to provide you with the background that you need to understand the rest of your results from previously published sources. "Adding Friction: Can I Apply What I've Learned to Identify a New Source?" "How do I Evaluate Original Content in a Database?" "How to Cite Original Content in a Database." Nominations for the 2016 Sara Jaffarian School Library Program Award for Exemplary Humanities Programming must be received by May 6, 2016. Applications, award guidelines and a list of previous winners are available at www.ala.org/jaffarian. School libraries, public or private, that serve children in grades K-8 are eligible. Nominated programs must have taken place during the current school year (2015-16). Programs that are still in progress as of the award deadline are eligible, and libraries are encouraged to self-nominate. Eligible humanities programs may be focused in many subject areas, including social studies, poetry, drama, art, music, language arts, foreign language and culture. Programs should focus on broadening perspectives and helping students understand the world and their place in it. They should be initiated and coordinated by the school librarian and exemplify the role of the library program in advancing the overall educational goals of the school. Transforming Tales, a program that used fairy takes from around the world to serve as a creative introduction to global studies for third-graders at the Meadowbrook School of Weston (Weston, Massachusetts). Who Are We?, a program that challenged seventh- and eighth-graders at the Inter-American Magnet School (Chicago) to explore the individual and collective behavior of human beings in a series of quarterly research projects. 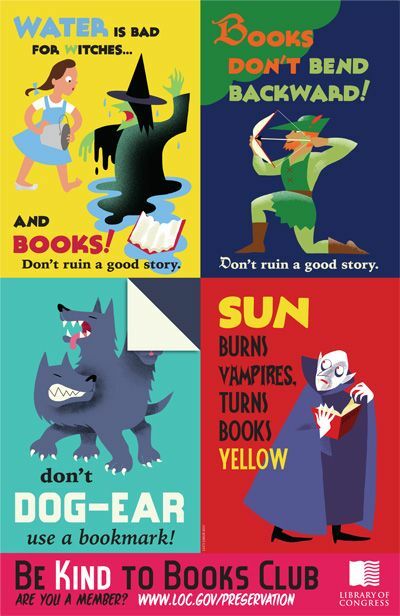 Download and print a variety of book care posters for FREE from the Library of Congress. 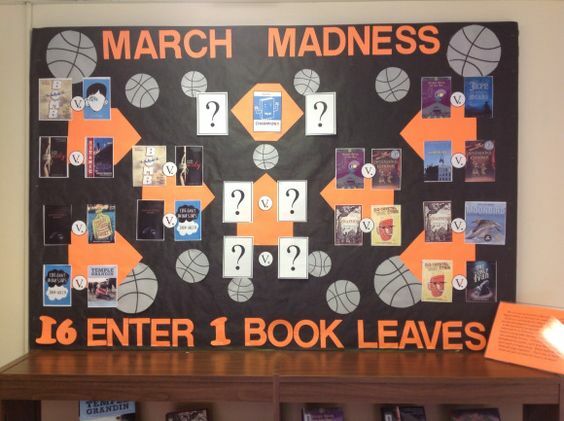 There are TONS of options and ideas for setting up a tournament of books for March Madness. Click on the pictures below to be taken to just a few of the many ideas out there. Diaz, S. M. (2016). Primed for a Fight. School Library Journal, 62(2), 13. The Youth Media Awards have been announced and there’s a chill in the air. 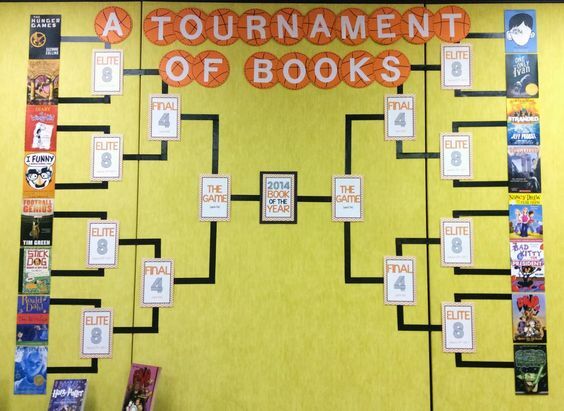 It can only mean that School Library Journal‘s March Madness-like tournament will soon be upon us—the eighth annual Battle of the Kids’ Books (BOB). 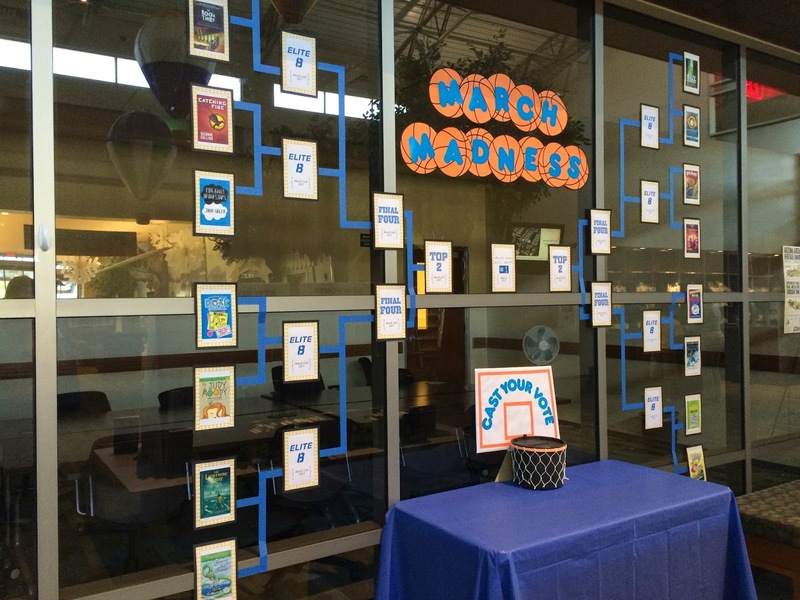 The virtual elimination contest matches up the best books for young people from the previous year in one-on-one literary battles. Unable to find original source. 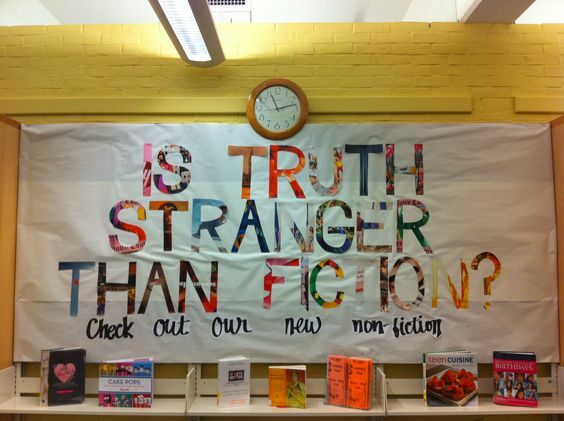 Our board near the checkout desk has something to ponder while you wait in line. This year, we'll feature interesting facts geared to increase knowledge of world geography and cultures. 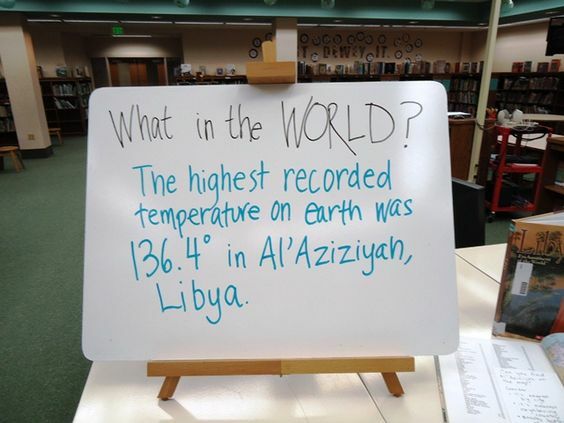 On a countertop next to this week's fact, students will find books on the topic (in this case, Libya), a map, and some questions that will inspire students to explore and make connections. 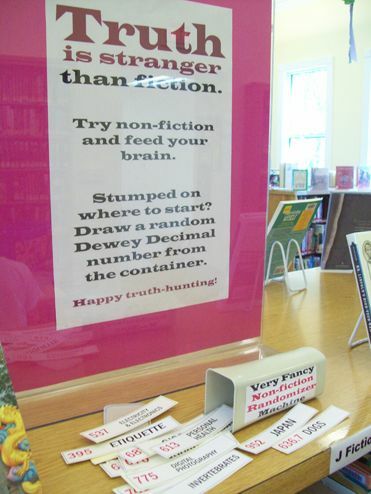 Pair a non-fiction book with a fiction book.